I had a plan, and it was a good one. Unfortunately, life doesn’t always follow the plan, and when one of my plans falls apart, it tends to do so in a rather spectacular way. With four young children (ages 11, 8, 5, & 2), an over-worked husband, and a writing career, life is insanely busy. Trying to manage the schedules of all four kids and still making sure everyone gets fed and ends up alive at the end of the day takes a high IQ, a generous portion of God’s grace, and a fleet of angels. This year, my oldest two boys are both playing Little League, and my 5-year-old is playing soccer. Yes, I acknowledge it’s crazy, but when you have three boys who all want to play sports, we just can’t figure out which one we crush and say “no” to! We dive into the insanity and enjoy every second of watching each of them do something they love. A few days ago, our 11-year-old had an away game about forty-five minutes away from our town. The 5-year-old had soccer practice in town. The plan was for me to grab sandwiches for everyone before we left. Then my husband was to take the oldest to his baseball game, which he would also umpire, and I was to take the 5-year-old to soccer. Of course, the other two kids would stay with me as well. After soccer practice, I was going to drive the forty-five minutes to the baseball game, figuring that the timing should still allow me to see half the game. Everything went perfect until the end of soccer practice. I hauled my utility wagon cart back to the car and decided to put my 2-year-old daughter in her car seat before unloading the cart. That way, she wouldn’t run off in the parking lot. Since we were immediately leaving on a long drive, I knew I needed to change her diaper first. Now my daughter just turned two, and is normally a very happy, easy-going girl, but she did not want her diaper changed. What she really wanted to do was drive the car, and I really think trying to diaper a cat would have been easier than getting her to lie still enough in the front seat of my minivan to strap the contraption on. After a horribly long time and a few tears (mine), I managed to succeed with the only side effect being that my stress level now felt like I’d just had to give a speech in front of a few thousand people. I successfully got her in her car seat, hopped in the car, and made sure the other two kids were in their places. Then I backed out and heard a sickening crunch. The wagon. I backed up into my beloved wagon. 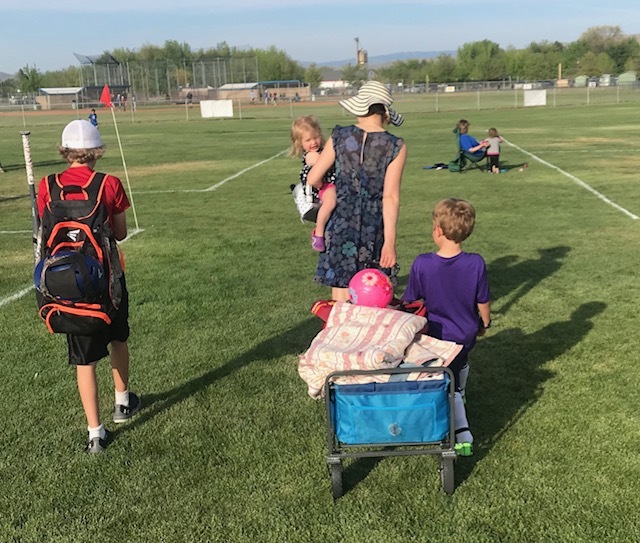 This is the wagon that hauls everything I need for the four possible seasons involved in a two-hour section of spring in Idaho, along with everything I need to manage three other children “watching” their brother’s practice or game. Yep, that’s mine, fully loaded down. Hopping back out of my minivan, I unloaded the wagon, noted that it didn’t look too bad, and hurriedly folded it and stowed it in the back. About an hour later (because kids happen and nothing just takes forty-five minutes), I finally managed to find a parking place near where my oldest was playing baseball. And when I say “near,” I mean that it’s a good quarter mile walk, or more, away. Once again, I pulled out my wagon cart, loaded it up with chairs, blankets, balls, sunscreen, waters, our still uneaten sandwiches, sodas, hats, and a baby doll. I got the kids out of the car and, with my daughter in my arms, I yanked the cart to follow along behind me. But it wouldn’t budge. Not even a little bit. One of the back wheels had apparently been completely bent when I’d run over it, and the cart was locked up. 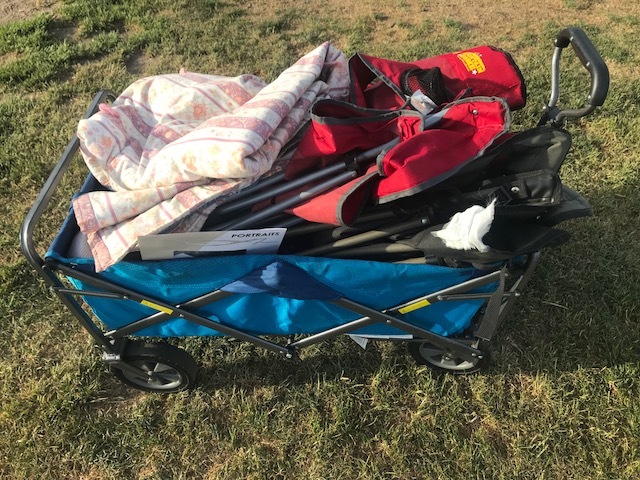 Unfortunately, there was nowhere for me to unload the cart, except back into the car, and there was no way for me to carry even a fraction of what we would need once we got to the ball field. The only options were to load everything back up and head home or find a way to get the cart to move. After coming this far, I didn’t intend to give up easily. I had the 8-year-old keep hold of his sister, and I tipped the cart over, fully loaded. I then stood on the damaged wheel, putting my full weight on it to try to straighten it out. I do think a little of the growling I did also helped. This was all while the 8-year-old reported that our sodas were spilling from the overturned cart and soaking everything. Of course, he was right. Hurriedly flipping the cart right side up, I was relieved to find that I could now pull it. Unfortunately, the back wheel still wasn’t turning, and it was extremely difficult to pull. But at least it would now move enough for me to drag. I was going to make it to that ball field. With one arm keeping hold of my daughter, I dragged the three-wheeled cart over a quarter mile with the other two kids trailing along. Out of breath and with muscles weak, I finally found the field where my son was playing. I pulled three chairs out and set them on the ground. Then I shoved sandwiches into the kids’ hands. Feeling satisfied that I had made it and was going to get to finally see some of the game, I grabbed my own sandwich and was just getting ready to sit down when my 5-year-old made the familiar announcement. “I need to go to the bathroom.” Sure enough, his words were said with the accompanying potty dance, so I knew this was serious. “Do you know where the nearest restrooms are?” I asked some of the people near me. “Over by the flag pole,” someone pointed. The game was over. All that work, and I didn’t get to see even a single play. My son’s team had been ahead by so much that they hadn’t played the standard six innings. They’d only played four and ended the game forty minutes before schedule. I finally ate my sandwich on the forty-five-minute drive home, after lugging my disabled cart the quarter mile back to the car. Though I fully recognize that I utterly failed in my goal, I actually wasn’t that upset that I had gone to such tremendous effort and difficulty to get to the game, only to miss the entire thing. Instead, I was actually rather proud. Not everyone can fail so spectacularly. I mean, after everything I’d been through, I arrived right as the game ended. That takes a certain amount of flair. So, why am I sharing all of this? I want to let all my mom peers, as well as my other fellow humans, know that you are not alone. Sometimes you try with everything you have in you and you still don’t meet your goal. Most of the time, it’s not even the big stuff. After all, everyone ended the day healthy, and we didn’t need to make any ER visits. But even the little stuff hurts and is extremely frustrating, especially when it’s on top of the exhaustion of trying to make it through the day. Social media and outward appearances are misleading. Even if you think someone has everything together, they don’t. Most of us are dragging a three-wheeled cart to a game that is already over. Things don’t go according to plan, especially when kids are involved. When you fail spectacularly, please know that, chances are, it isn’t really a fail at all. It’s just a different result than you intended. What you don’t realize at the time, and sometimes even never realize, is that your goal isn’t God’s goal. I didn’t know that the purpose behind me dragging that cart wasn’t so that I could watch my son’s game. When we got home, my 11-year-old overheard me giving the report to my husband of what had happened. Before he climbed into his bunk bed for the night, my sweet boy came up to me, wrapped his arms around me, and laid his head on my shoulder. To him, that was unbelievable. My plan failed spectacularly. But that night, my son realized in a concrete way how very much I love him. I love him the three-wheeled cart kind of way. That’s the kind of success you can never plan for. Likewise, may God end your failed plans and three-wheeled cart misadventures with that kind of success. all four wheels again the next day. Good little wagon. ***Please note: Links used in this post are likely affiliate links. It doesn’t cost you anything extra to click and buy, but I get a small commission. Amanda Tru is a participant in the Amazon Services LLC Associates Program, an affiliate advertising program designed to provide a means for sites to earn advertising fees by advertising and linking to amazon.com.